I love shoes - you really can't have enough pairs - but getting wider fit shoes and boots isn't always easy...of course when you do, you don't ever want to take them off! Here are some great ranges of wider fit shoes - including shoes for parties as well as comfy daywear and oh so soft slippers! 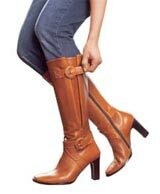 Also check out wider fit boots - with extra room in the calf - fabulous! I love Evans, it was the first place I found boots to fit my chunky calves! Wide selection of shoes and boots, all in a wider fitting and at fantastic prices, fashion doesn't have to break the bank! Despite there being a deluge of jewelled flip-flops on the catwalk and a whole host of high street versions the jewelled toe-post sandal is on my list of footwear collectables this summer Wear with a plain kaftan for the day but add bright toenails and a slinky satin dress in print or bold colours to create a gorgeous after dark high summer style. Platforms, wedges,and sky high heels are everywhere, even the most seasoned fashion follower would be hard pushed to perceive the new season's footwear as anything less than challenging. It's certainly not recommended for those wishing to maintain a low profile - or those living with a low ceiling, for that matter. There's nothing, then, remotely low about the fashionable of foot this season. Another shoe trend with retro elegance is the round-toed court shoe. Having made its debut in the collections of designers like Marc Jacobs to accompany the forties, knee-length skirts, it takes on another life when worn with jeans. Still crisp though when accessorising a flared or a-line skirt, heels can be as low or high as you please. There are also chunky more 70's influenced versions from Pod, sporty versions from Camper and classic versions from Esprit. Uggs are goatskin boots with a sheepskin lining and usually a synthetic sole. They are extremely warm and comfortable and designed to be worn without socks to maximise the properties of the sheepskin. Ugg boots are versatile and can be worn with bare legs, tights, skirts, shorts and trousers.